A number of years back my daughter and I attended a nature journalling workshop at the nearby botanical garden, where we were first introduced to the lovely detailed drawings and observations of Edith Holden’s Nature Notes For 1906. 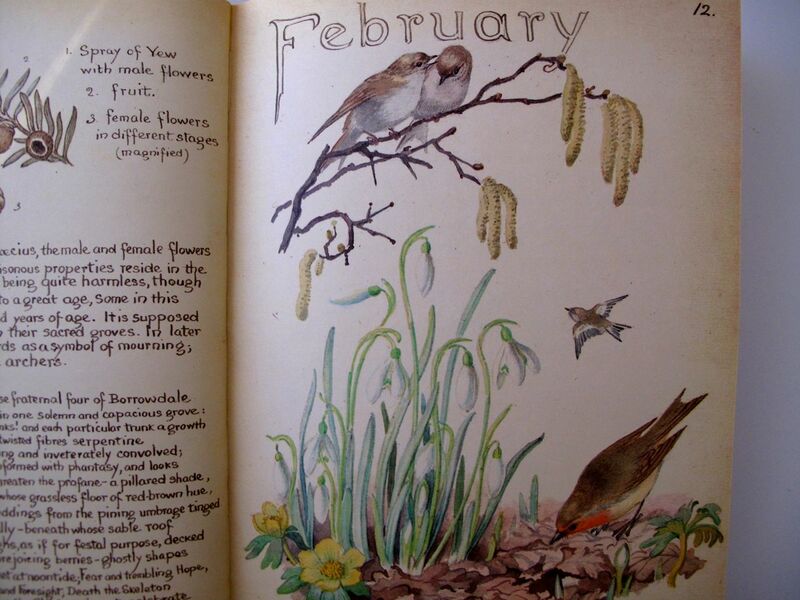 Holden was a 35-year old artist and illustrator living with her family at Gowan Bank, Olton, Warwickshire, when she meticulously crafted this month-by-month collection of poetry, flowers and wildlife. 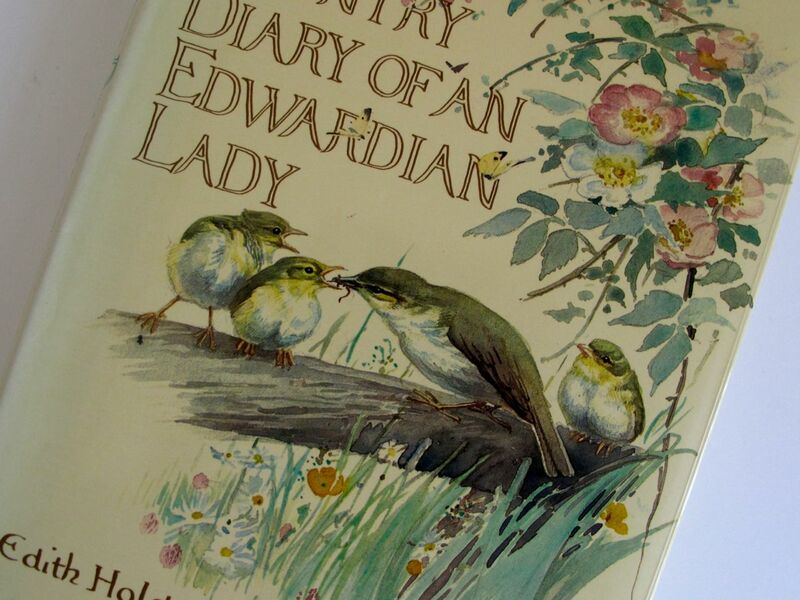 A facsimile of her diary was published years later in 1977 under the title, The Country Diary Of An Edwardian Lady. A year or two after the journalling workshop my daughter surprised me with a copy of Holden’s diary as a Mother’s Day gift. While reshelving some books I came upon it today and as always, once I opened it up I could not resist the wonders within its pages. The watercolors are charming and in general I have always been intrigued with artists’ sketchbooks. 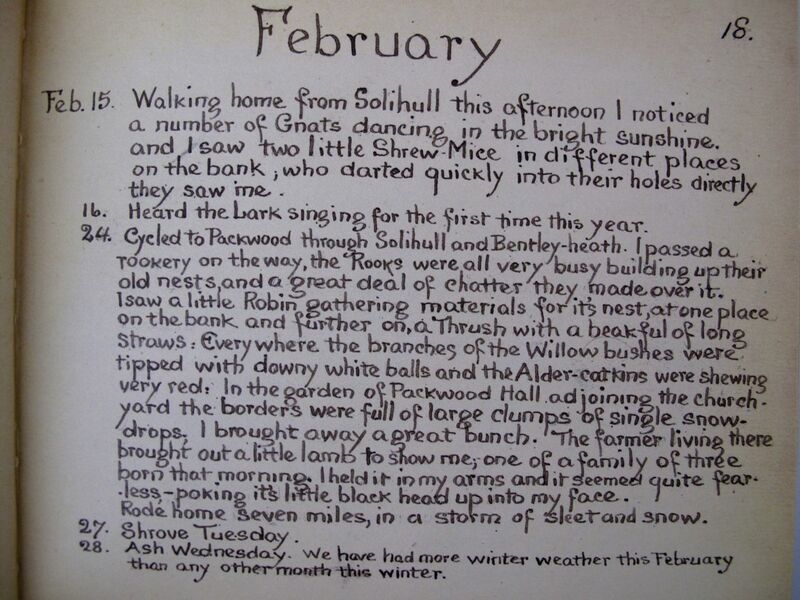 I decided to look up February to see what this month had been like in 1906 for the naturalist. I was surprised to see a lovely little sketch of Common Gorse (Ulex europaeus), something I had only yesterday learned about through a photo on Gardening Jules. 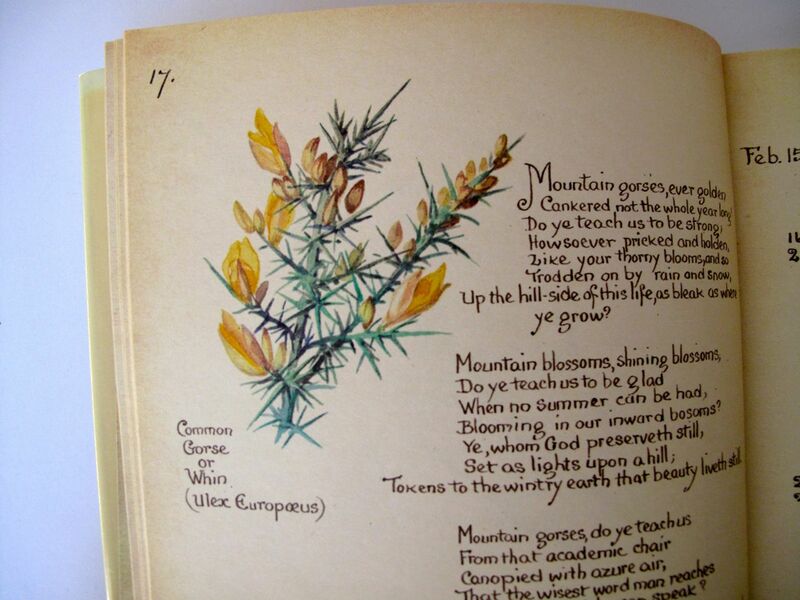 On February 12 Holden noted she had gathered some Gorse blossom on her way home from visiting the violet wood. That does sound splendid. And while I have been indoors and overly obsessed with the weather lately, she recorded this entry for February 24. Cycled to Packwood through Solihull and Bentley-heath. I passed a rookery on the way, the Rooks were all very busy building yup their old nests, and a great deal of chatter they made over it. I saw a little Robin gathering materials for its nest, at one place on the bank and further on, a Thrush with a beakful of long straws. Everywhere the branches of the Willow bushes were tipped with downy white balls and the Alder-catkins were shewing very red. In the garden of Packwood hall adding the church years the borders were full of large clumps of single snowdrops. I brought away a great bunch. The farmer living there brought out a little lamb to show me, one of a family of three born that morning. I held i in my arms and it seemed quite fearless—poking its little black head up into my face. Rode home seven miles, in a storm of sleet and snow. 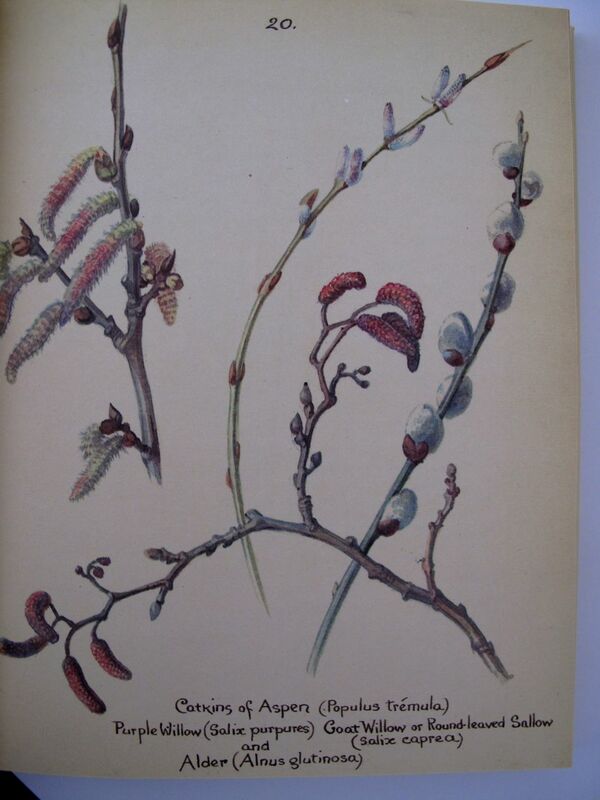 With many blogging friends writing about snowdrops and after seeing catkins used in flower vases, I realize there is so much more contained in the pages of this journal than what I have gleaned before. After a few years of following blogs I have more context for seeing and understanding Edith Holden’s world. I am looking forward to reading back through her observations. There is something decidedly unique about seeing Holden’s work on paper. Still, I wonder if she would have also considered keeping a garden blog. Holden, Edith. 1977. The Country Diary of an Edwardian Lady, 1906: A Facsimile Reproduction of a Naturalist’s Diary. New York: Holt, Rinehart and Winston. This entry was posted in garden and tagged Edith Holden, naturalist journal, The Country Diary Of An Edwardian Lady, winter garden on February 19, 2015 by pbmgarden.